Cabernet Franc can perform well in a slightly cooler climate, but it enjoys excellent sun exposure and drainage for complete ripening and the best possible flavors. There are microclimates where this varietal thrives in this county. We were able to find those characteristics in a local vineyard close to us. The fruit was sourced from the Los Alamos Hills Vineyard. Though the Los Alamos region does not have an AVA, it should. The reds here are meaty with a distinctive deep berry, earthy quality, and this wine follows suit. 2010 was a great year for reds and our first red release from this vintage shows what it is all about. We selected three barrels that stood out from the others to create this special selection. 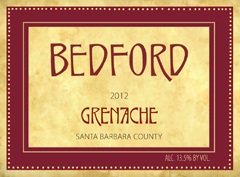 Grenache is known for its intriguing bouquet. Our 2010 has an enticing nose of cranberry, rose petals and spice which carries through to the palate where it is joined by layers of red berry fruit and a touch of vanilla from 24 months barrel age in neutral oak. Its deep ruby color matches the depth of flavor. 90 cases made. Almost sold out. This Spanish red varietal is commanding attention. The fruit is from the Cuyama area of Santa Barbara County, a region gaining in reputation. Dark, opaque purple in the glass, our 2008 is a wine of depth showing a rich blackberry/spice character and a long velvety finish. Though intense, well structured and will age for years to come, the complexity is such that it is deceptively food friendly and enjoyable now. Serve with more flavorful dishes such as roast beef, herb crusted lamb, or cassoulet. SOLD OUT! 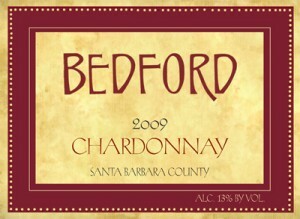 You are currently browsing the Bedford Winery blog archives for February, 2011.